Could honey combat respiratory disease? Scientists at the University of Southampton are investigating the healing properties of honey to aid the fight against antimicrobial resistance. Working with Matoke Holdings Ltd, the research team are using Surgihoney, an engineered, medical honey that has a potent antimicrobial agent with antibiofilm activity, to combat Chronic rhinosinusitis (CRS). CRS is a common condition that affects 15 per cent of the UK population and costs the NHS about £100m a year. Patients usually have recurrent bacterial infections in the sinus cavities, the hollow spaces around the cheek bones and eyes that warm, moisten, and filter air. Conventional antibiotics are rarely effective in eradicating the bacterial in CRS patients, and many require multiple sinus operations during their lifetimes. New treatments are needed to prevent disease recurrence, and to reduce reliance on antibiotics and surgery. Researchers are conducting preclinical studies to demonstrate the effectiveness of Surgihoney in killing the bacteria implicated in patients with difficult to treat or chronic rhinosinusitis. Surgihoney can destroy Gram-positive and Gram-negative bacteria, including multi-drug resistant strains, such as E.coli, MRSA and Pseudomonas aeruginosa. It is also effective against fungal organisms. It’s main antimicrobial activity is due to the sustained delivery of reactive oxygen. Surgihoney has an EU CE approval mark and is already available to treat infected acute and chronic wounds. Initially the focus was wound care but new medical uses are being investigated. Mr Rami Salib, Associate Professor of Rhinology at the University of Southampton and Consultant Ear, Nose and Throat Surgeon at Southampton General Hospital, who is leading the study said: “The problem of chronic sinus infections not only impacts significantly on patients’ quality of life but these infections tend to be resistant to antibiotics and patients often end up needing multiple operations and a lot of antibiotics during their lifetimes. “There is an emphasis on trying to develop new strategies and new therapeutic options to reduce reliance on antibiotics and the need for operations which are quite expensive. This is particularly pertinent in an over-stretched and under-funded NHS. The current study involves laboratory research to test the ability of Surgihoney to kill bacterial biofilms. The aim is to extend this work into the clinical arena by conducting a small scale clinical trial to investigate its efficacy in treating chronic rhinosinusitis patients following endoscopic sinus surgery. 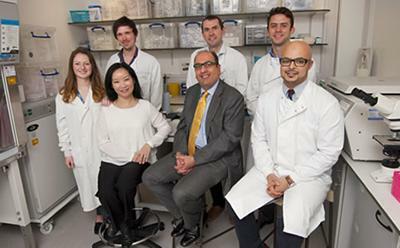 Mr Salib said currently the research team’s focus is chronic rhinosinusitis but Surgihoney had potential applications in other respiratory infections, such as cystic fibrosis, chronic obstructive pulmonary disease, asthma and tuberculosis. As part of the research team, Ali Salamat, a Rhinology Clinical Research Fellow and ENT Specialist Registrar, has won a one-year research fellowship from the Royal College of Surgeons of England to conduct basic scientific research on Surgihoney’s antimicrobial profile. He said: “One in five of hospital-acquired infections are attributed to MRSA. Current treatments for MRSA infections are limited due to expense and the problem of emerging resistance. Our preliminary findings have shown Surgihoney is not just effective in killing MSSA (methicillin-sensitive Staphylococcus aureus) but also MRSA (methicillin-resistant Staphylococcus aureus). Ian Staples, founder and chief executive of Matoke Holdings Ltd, said: “I am incredibly proud to be part of the team now working with some of the top clinical innovators in Britain to take this technology into a wide arena of infection control. The Southampton Upper Airway Research Group consists of Mr Rami Salib, Associate Professor of Rhinology, Consultant ENT Surgeon and head of group; Dr Sylvia Pender, Associate Professor of Mucosal Immunology; Dr Ray Allan, Wellcome Trust Clinical Research Facility Post-Doctoral Fellow; Mr Ali Salamat Royal College of Surgeons of England Research Fellow and ENT Specialist Registrar; Mr Tim Biggs, NIHR Academic Clinical Fellow and ENT Specialist Registrar, and Ms Rebecca Holding, Research Technician. The project has been awarded multiple grants, including the British Medical Association through the Helen H Lawson grant, NIHR Southampton Respiratory Biomedical Research Unit pump-priming grant, the Higher Education Innovation and Enterprise Fund, Rosetrees Trust Research Grants and Otorhinolaryngological Research Society grant.